Artichoke Torta holds a lot of meaning for me. That, and its cousin zucchini and rice torta along with pasta con pesto, were among the first authentic Italian foods I ever tasted. The mother of one of my best high school friends made them. Lisa had a Nonna and Nonno. I had an Oma and Opa, which is to say she grew up eating Italian food and I was more accustomed to German fare. My early exposure to spaghetti came from a guy named Chef Boyardee. I thought he made a pretty good sauce until I was invited to dinner at Lisa’s house. I was floored to learn that her mother made the sauce from … tomatoes! I had no idea, and no clue how good red sauce could taste. Lisa introduced me to lots of Italian dishes, including savory torta, which has become one of my go-to appetizers. This week, the Sunday Supper tastemakers have been busy in their cucinas getting ready for tonight’s Italian Fest. We will gather at 7 p.m. ET for our weekly Twitter party, celebrating the very best of Italian cuisine. No doubt you’ll be ready to mangiare afterward. The torta is best served warm or at room temperature, but it should sit for at least 30 minutes before cutting. This will set it. When you remove the torta from the oven, some of the olive oil will bubble and pool. As the torta cools, the liquid soaks into the mixture which firms as it cools. I have also made the zucchini and rice version, which is firmer yet. A hunk of either for your work lunch is a good thing. That is if you have any left over after your party. Simmer frozen artichokes according to package directions, 15 to 20 minutes or until soft. Drain, pressing out as much liquid as you can. Cool, then chop finely. 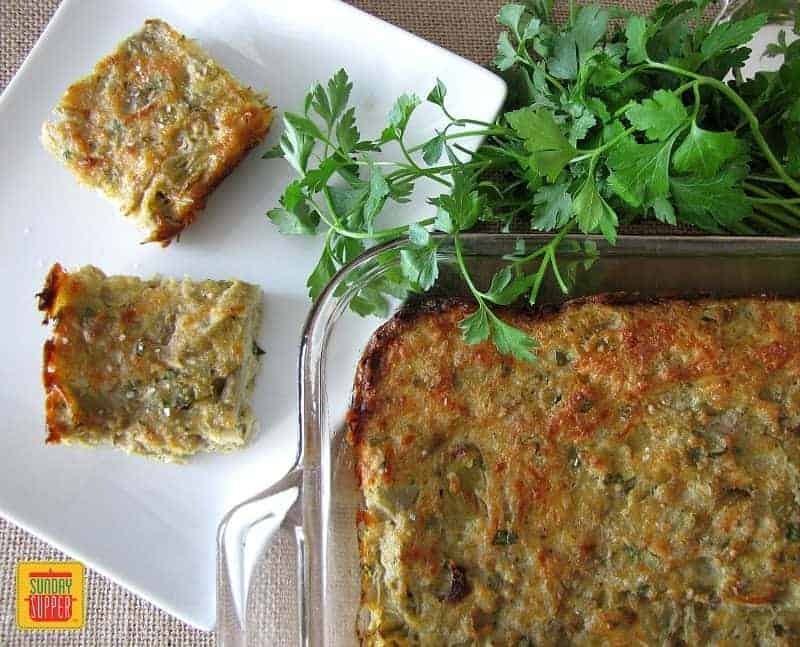 Mix with garlic, onion and parsley, and set aside. Beat eggs in large bowl until frothy with Italian seasoning, pepper and salt. Stir in bread crumbs, Parmesan cheese and olive oil. Mix in artichoke mixture until evenly distributed. 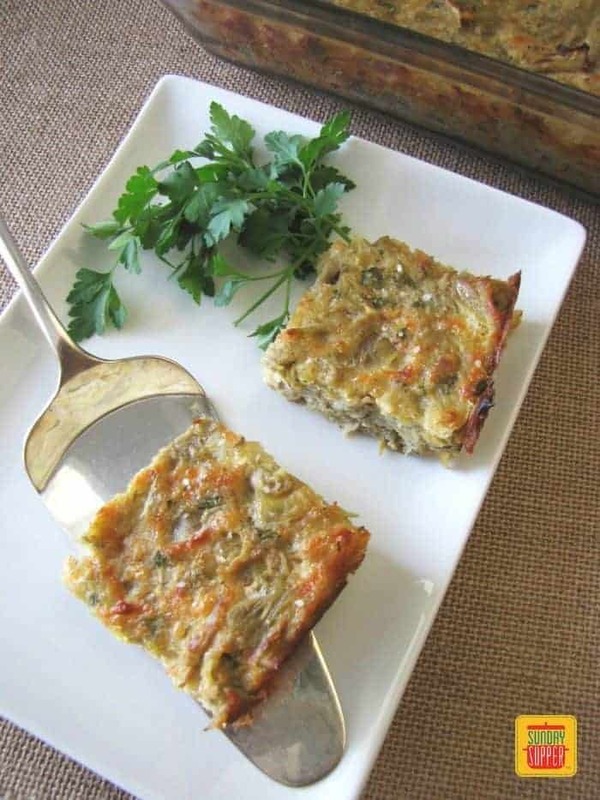 Pour batter into a 9- by 13-inch baking dish that has been lightly greased with olive oil or nonstick vegetable spray. Bake in preheated 325-degree oven for 45 to 50 minutes until golden brown. Let cool and cut into 1-1/2-inch squares. The torta is best served warm at room temperature. Check out this week’s recipes and don’t forget to join us tonight for Italian Fest on Twitter at 7 p.m. I have a soft spot for artichokes… this recipe is a definite keeper! Your memory of Chef Boyardee made me laugh, Janet. The first pizza I remembering eating at home was from one of his box kits and I sure loved his little ravioli. Your torta looks wonderful! What a perfect appetizer for a crowd. I love artichokes! Sounds like a great appetizer! For sounding so complicated and fancy, this actually sounds quite easy to make! Making this for our next GNO! Thank you! Love the artichokes in this- I think it would be well received when I entertain. Glad to see I’m not the only one who made an artichoke dish this week. Looks delicious! 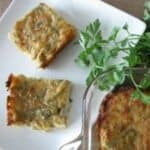 I have never made an Artichoke Torta…I must fix that! Tortas are so good! Breakfast, brunch, lunch, dinner, snack; you can make them for any meal of the day. And this artichoke one means it’s going on the menu soon!